The 5V to 12V Sensor Adapter provides an easy solution for using 12V sensors with Phidgets. Simply hook up the sensor to the terminal blocks, and connect it to an Analog Input or VINT Hub Port. 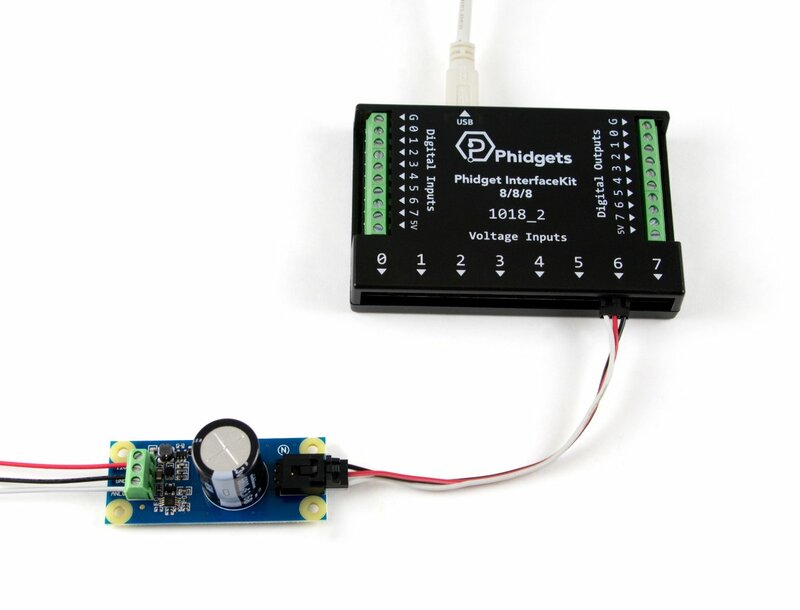 The 1144 is powered by the Phidget it's plugged into, so you don't need a separate power supply for the sensor. For a list of sensors that can be interfaced with the 1144, see the Connection & Compatibility tab. 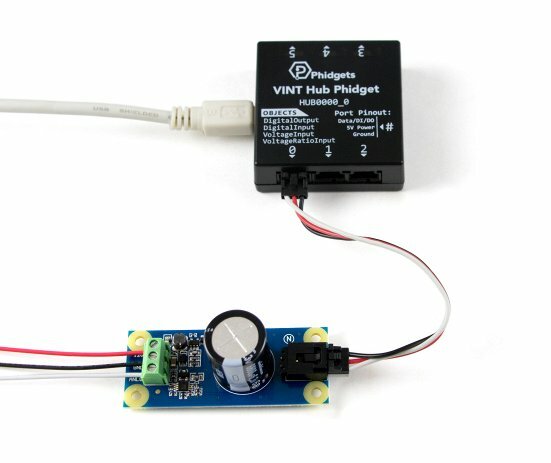 This adapter can be read by any Phidget with an Analog Input or VINT Hub port. It will connect to either one using the included Phidget cable. VINT Hub ports can behave just like Analog Inputs, but have the added flexibility of being able to be used as digital inputs, digital outputs, or ports to communicate with VINT devices. For more information about VINT, see the VINT Primer. Connect the 12V sensor to the 1144. 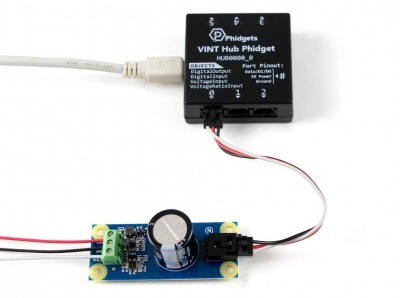 Connect the 1144 to the HUB0000 with the Phidget cable. Now that you have everything together, let's start using the 1144! 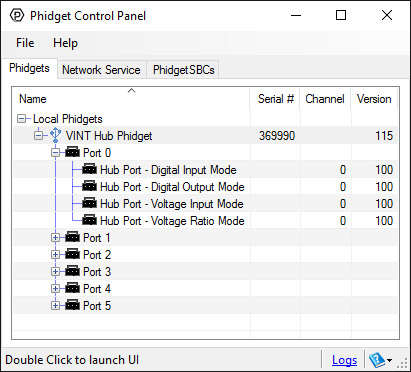 In order to demonstrate the functionality of the 1144, we will connect it to the HUB0000, and then run an example using the Phidget Control Panel on a Windows machine. Linux users can follow the getting started with Linux guide and continue reading here for more information about the 1144. 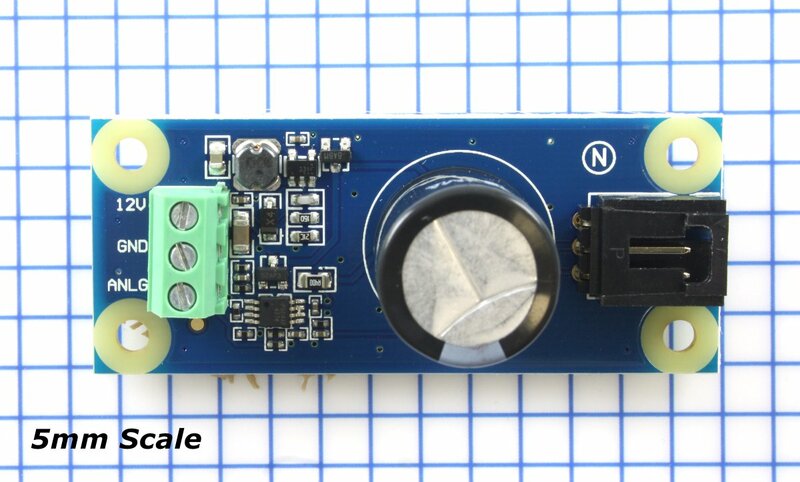 To interface with a CE transducer sold by us, simply connect the wires as shown in the following image. 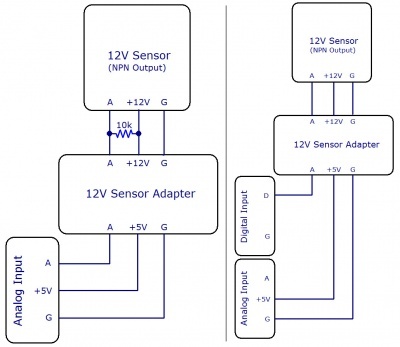 In order to interface with a 12V sensor with an NPN output, you need a 12V sensor adapter and an Interface Kit. There are two ways to connect them, as shown in the figures. 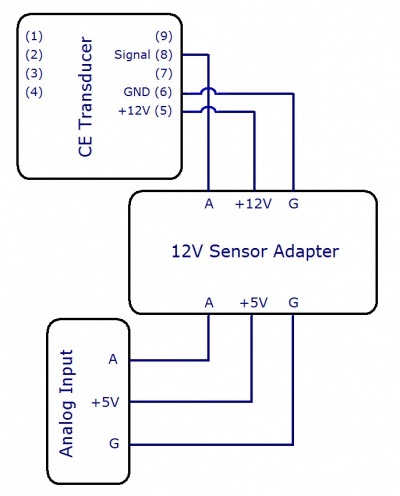 The first way simply involves connecting the 12V sensor adapter to an analog input on the Interface Kit, and then attaching the 12V sensor to the adapter with a 10kΩ pull-up resistor placed across the +12V and analog signal lines, as pictured. There should be two 10kΩ resistors packaged with your 12V sensor adapter. 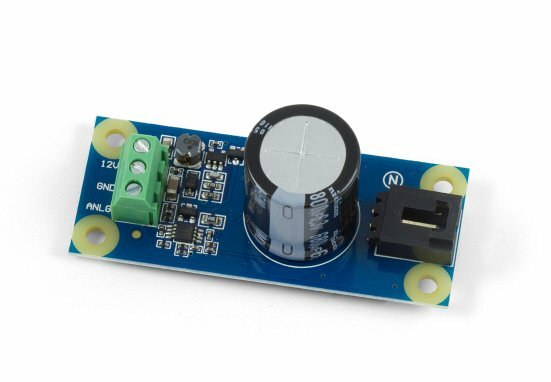 When using this setup, the voltage input will show a voltage of about 5V when the NPN sensor is open, and a much lower value (less than 1V) when the sensor is closed. Likewise, if you're using an active-low digital input, the input will be low when the NPN sensor is open, and high when it is closed. 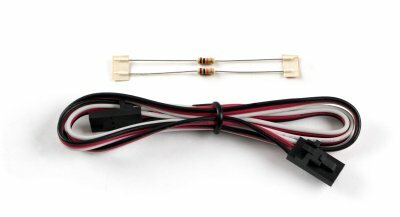 In order to interface with a 12V sensor with an PNP output, you need a 12V sensor adapter and an Interface Kit. 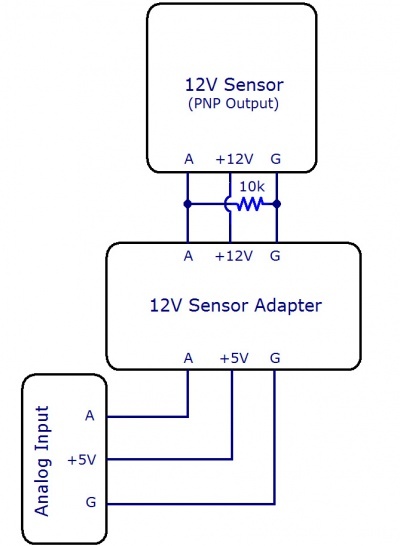 Simply connect the 12V sensor adapter to an analog input on the HUB0000 (, and then attach the 12V sensor to the adapter with a 10kΩ pull-down resistor placed across the ground and analog signal lines, as pictured. 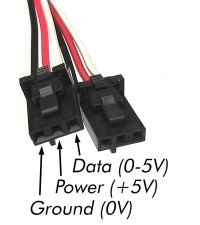 There should be two 10kΩ resistors packaged with your 12V sensor adapter. The 1144 returns a voltage between 0 and 5 volts. Check the documentation for your specific sensor to determine the formula for converting from return voltage to the measured value. This device doesn't have an API of its own. It is controlled by opening a VoltageInput channel on the Phidget that it's connected to. 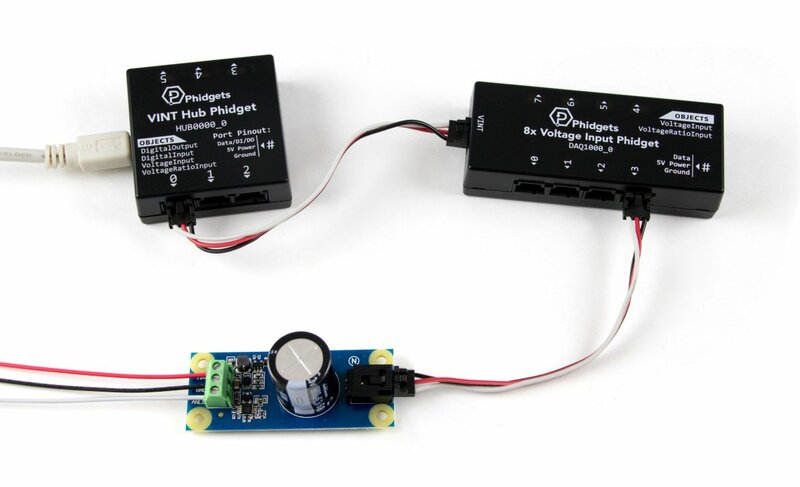 For a list of compatible Phidgets with Voltage Inputs, see the Connection & Compatibility tab. You can find details for the VoltageInput API on the API tab for the Phidget that this adapter connects to.